When I was a freshman at University I only had one friend. I was incredibly gregarious in high school, but when I got to Uni I decided it best to buckle down, be anti-social and focus on getting good grades. After I read Zen and the Art of Motorcycle Maintenance by Robert Pirsig I didn't speak for close to a week. I was too busy processing it in my head to come out of my mental cocoon. My one friend was concerned and she asked me if I was alright, and shortly breaking my self imposed vow of silence I responded that I was just thinking and I would talk to her once I was done. If I'm remembering correctly it was about 5 days until I spoke to anyone again. I've never had a similar experience with any book, and frankly I'm fine with that. It wasn't pleasant. It's hard for me to remember exactly what it was about the book that made me semi-catatonic. It delivers on much that requires concentration and processing, and it's formula of slowly lengthening chapters on philosophy slowly descends the reader into its more complex material. It's ostensibly just a book about a guy riding a bike across country with his son, and that's how it starts. But it's also about a journey into madness by a man who's remained trapped in his own self-imposed Aristotelian cave of thought for most of his life. And these are the good bits. I know many classicists criticize Pirsig for misunderstanding the Phaedrus dialogues and there is a good discussion to be had there. I've read a few papers on how the book is based on either misunderstandings of the Phaedrus dialogues or of Aristotelian thought, and frankly I just find this kind of thinking pedantic. Who cares? Maybe Pirsig did misunderstand them. However, he was also a professor of rhetoric and so maybe his misinterpretations carry a bit more validity. As Socrates might argue, it's not as though we can ask the text. Pirsig makes a strong argument for why the sum of the parts is not equal to the whole(i.e. gestalt). An important concept I would return to later in my study of metaphor. Looking back it seems silly that something as obvious as gestalt even needs to be argued for, but when I read it the idea was rather mind-blowing. Now it seems obvious. His take on beauty was new and different to me as well. I had never thought of beauty in terms of underlying form, but when I was exposed to it I once again could relate as a tinkerer to what he was talking about. Another example of him providing a language and structure of thinking for a budding tinkerer. As I learned more about Zen Buddhism and classical Greek philosophy I went through a period where I was frustrated with Pirsig, because I thought he really didn't know what he was talking about. When I decided to get a minor in comparative religion and started reading more about Zen Buddhism I began to see Pirsig as a charlatan. Like an idiot Beat poet writing about dharma without knowing its actual meaning, choosing to use the word because they objectify a people and culture as oriental and want to exploit them for their canvas. There's a period in post-war American literature where this happens a lot. I'm looking at you Jack Kerouac, Alan Watts, and Carlos Castaneda because you're the only guilty parties I'm aware of although I'm sure there are more. However, I think it's wrong to put Pirsig in this tradition for the same reason I think it's wrong to hype his misinterpretation of some Greeks. Pirsig has important things to say and if that requires angering the pedant in us than so be it. We shouldn't mistake the forest through the trees. 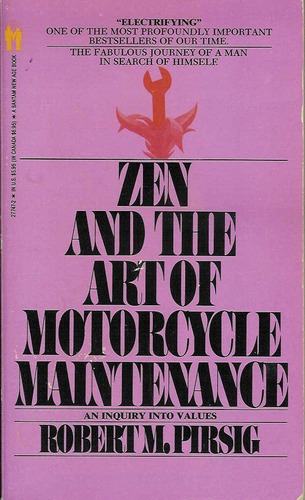 Zen and the Art of Motorcycle Maintenance arrived to me at a formative stage of my intellectual development. It spoke to me and it helped give me language to talk not just about software, but about technology and the qualities of it. For most of my professional software development career I've been involved in testing software systems, typically in the area of networking and communications. I can't even imagine what my career as a 'quality' engineer would have looked like had I not read this book.